Beautiful third row home with views of both the ocean and the Ocean Isle Beach Bridge. 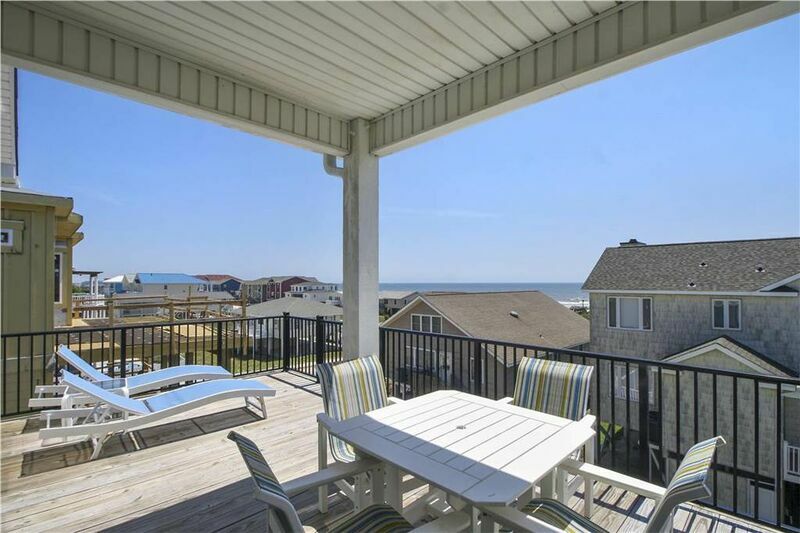 This home is located in The Resort, on the desirable west end of Ocean Isle Beach, with quick and easy beach access and a short walk to the pier. It accommodates 16 in 5 bedrooms, 5.5 baths. Enjoy views of the Atlantic Ocean from the large open living/dining/kitchen area featuring hardwood floors, quartz countertops, stainless steel appliances, and a glass tile backsplash. Outside there is a 12 x 26 pool with room for sunbathing and lots of decking that makes the most of your views. If you want an added bonus, guests also have access to the Oceanfront Private Community Pool and Clubhouse. Other amenities include Central Heat and Air, 7 flat screen TVs, 2 Smart TV's, 2 DVD players, wireless internet access, Dishwasher, Washer/Dryer, Hot/Cold Enclosed Outside Shower, Grill, 2 refrigerators, 2 microwaves and indoor seating for all of your guests. Non-smoking. No pets. Sleeps 16. Bedding: Second Floor: Master Bedroom: 1 King; First Floor: 2 Queens, 2 Queens, 1 King, 1 Twin and bunk with double bed on top and bottom, Sleeper Sofa. Linens and towels are provided. Beautiful home and well furnished. Excellent view of the ocean and canal with a very short walk to the beach. All the accommodations were outstanding and our grandchildren loved the pool. This is the best home we have rented in Ocean Isle in the past four years. Our grandchildren loved the sitting area and two orange chairs. We would definitely recommend this house and hope to return next year.